Aikido is a Japanese martial art that utilizes circular motion to neutralize an attack. Refined from samurai battlefield (jujutsu) techniques, Aikido blends effective technique with high moral philosophy. The goal of Aikido training is not to defeat your enemy, but rather to control and defuse a potentially dangerous situation....thereby allowing ALL involved to walk away unharmed if possible. Minoru Mochizuki and Gozo Shioda. While the techniques we practice are considered "Pre-War" the approach of Sensei Hudson Harris in teaching them is that of "softness, fluidity and mutual co-operation" during training. A typical class will begin with warm up's, stretching and ukemi to warm the body and prepare it prior to the application of actual techniques. (10th Dan) who founded the Yoshinkan style of Aikido and one of Aikido founder Morihei Ueshiba's most senior students. Master Shioda founded the Yoshinkan style of aikido in 1955, which emphasizes self-defense applications. In 1957, Master Shioda developed the Senshusei course, an intensive aikido training program, for the Tokyo Metropolitan Police Department. 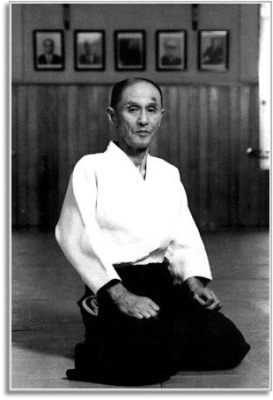 In 1961 Master Ueshiba promoted Gozo Shioda to the rank of 9th dan in Aikido. In 1990 he established the International Yoshinkan Aikido Federation. That same year, he established the international Senshusei program to develop Yoshinkan Aikido instructors across the world. Master Shioda died on July 17, 1994. Aikido Shugyo: Harmony in confrontation(2002,published posthumously). "Either you control your opponent or he defeats you. You cannot complain that he did not follow the rules. You have to overcome your opponent in a way (technique) appropriate to each situation". Minoru Mochizukiwas a Japanese martial artist who founded the dojo Yoseikan. He was a 10th dan in Aikido, 9th dan in jujutsu, 8th dan in iaido, 8th dan in judo, 8th dan in kobudo, 5th dan in kendo, 5th dan in karate, and a 5th dan in jojutsu. Aikido founder Morihei Ueshiba and Gichin Funakoshi, founder of ﻿Shotokan Karate﻿. Believing that the martial arts had become distorted by specialization into separate disciplines or transformed into sports, Mochizuki achievement was to assemble the major techniques of the Japanese martial tradition into a single structure, as it was once practiced. He oversaw the development of the system from his home in Shizuoka, Japan, where his dojo, the Yoseikan,was often visited by martial arts practitioners from all over the world. He died in Aix-en-Provence, France 2003. During his life Master Mochizuki wrote several books that are now very rare and difficult to find.